This long passport cover is design for family use, there are enough space inside for carrying passport and documents. Order process for this item: Finish Product: https://i1243.photobucket.com/albums/gg541/hykcwyre/Information/eng_zpstdrtncob.png https://i1243.photobucket.com/albums/gg541/hykcwyre/Information/brand-concept-engpt1_zpsjwo9yq6l.jpg https://i1243.photobucket.com/albums/gg541/hykcwyre/Information/brand-concept-engpt2_zpsje81qzdk.jpg https://i1243.photobucket.com/albums/gg541/hykcwyre/Information/brand-concept-engpt3_zps68nb8gcf.jpg ***Description As an organize traveller like you, you always want to keep everything in place and safe during ur trip. 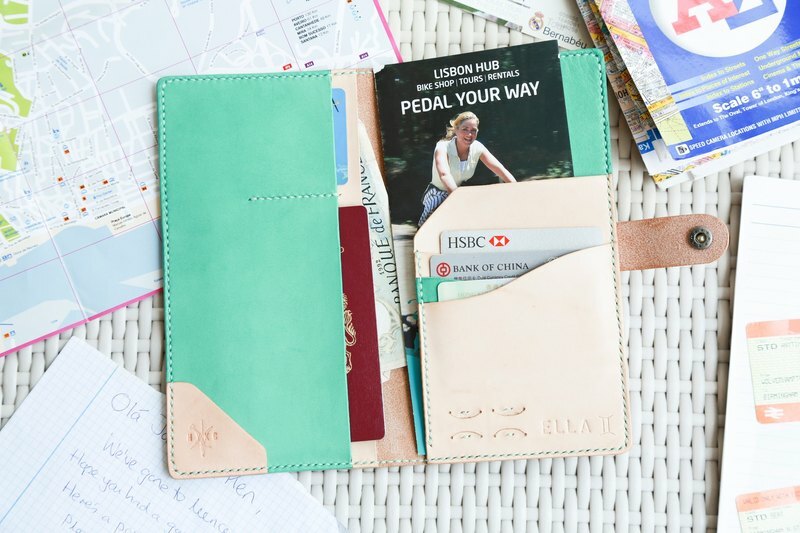 This colourful passport made by Vegetable tanned leather that gives a soft and smooth touch and it will aging nicely. It is using snap button for closure (or we can make another closing style for you) Inside There is 3 card slots, 1 open space for boarding pass and with our heat branded logo, 2 big pocket for flight tickets or documents, a medium pocket for passport and 1 smaller pocket for hotel room key, a pen slot outside. Details: - Made By Vegetable Tanned Leather - Snap Button Closure - 1 Pen Slot - 3 Card Slots - 2 Sim Card Slots - 1 Small Pocket - 1 Medium Pocket - 3 Large Pocket - 1 Open Space - All Handmade and Hand Stitched - Heat Branded Logo ***Dimensions: Width: 4 1/2" Height: 8 1/2" Depth: 3/4" ***Color/leather https://i1243.photobucket.com/albums/gg541/hykcwyre/color%20swatches/c-d-e-color-swatch-combine-eng_zps18ntsbeu.png https://i1243.photobucket.com/albums/gg541/hykcwyre/color%20swatches/s-w-0-color-swatch-combine-eng_zpsixjs9mvm.png ***Leather caring Each customer will receive a small can of our home-made leather balm. Simply apply it on leather every 3-6 months. For leather maintainace, use a dry soft cotton fabric/cloth, gently apply a thin layer of leather balm onto the leather surface, when it absorb into the leather, repeat the same step 2-3 time. *For Italian cow leather (C,E Series) there is a layer of natural wax on top of the surface, it will absorb/drop off upon use, the scale depend on how the user use it. When above 80% of the wax is consumed, you may consider for leather maintenance. ***Personalise * We are able to engrave your favourite quote, initials or names, (Addidtion fee needed for engraving 20 single letters or above) please feel free to send us a convo and we will make it happen. * If you have any request (such as width or specific shape), please feel free to send us a message, we treat your order as priority. * We can also engrave symbols, each symbol size is fixed should you need to know about the dimensions please feel free to contact us. https://i1243.photobucket.com/albums/gg541/hykcwyre/Information/1F1ST56_zpsuzcy7j7k.jpg https://i1243.photobucket.com/albums/gg541/hykcwyre/Information/IfW5sg8_zpscp7ilgrt.jpg ***Engraving Available Font and size : If there are no information about which style of font, we will use style 1 to engrave the word. https://i1243.photobucket.com/albums/gg541/hykcwyre/Information/fontstyle1_zpstp70kqao.png https://i1243.photobucket.com/albums/gg541/hykcwyre/Information/fontstyle2_zpsnugutlhh.png https://i1243.photobucket.com/albums/gg541/hykcwyre/Information/fontstyle3_zpsik8oqd2u.png https://i1243.photobucket.com/albums/gg541/hykcwyre/Information/Fontstyle-4-uppercase_zpshjvql3b7.png https://i1243.photobucket.com/albums/gg541/hykcwyre/Information/fontstyle-4-lowercase_zpsgbx1vgbk.png Only style 4 have Uppercase and Lowercase Let us know if you like our symbol on your product! https://i1243.photobucket.com/albums/gg541/hykcwyre/Information/1Y1A8136_zpswzxzpavp.jpg https://i1243.photobucket.com/albums/gg541/hykcwyre/Information/symbols65-102_zpsfkrgmtkd.png https://i1243.photobucket.com/albums/gg541/hykcwyre/Information/symbols103-113_zpslzxkhvvl.png https://i1243.photobucket.com/albums/gg541/hykcwyre/Information/symbols-114---120_zpsh7n2tij7.jpg *We are able to brand letters in gold / silver color (additional needed) https://i1243.photobucket.com/albums/gg541/hykcwyre/Information/fontstyle_zpsokwlhmmh.png * We are able to engrave monograms, additional HKD$50 is needed, A circle monogram with 32 mm diameter , personalized it with 2-3 initials of your choice. https://i1243.photobucket.com/albums/gg541/hykcwyre/Information/monogram_zpsw09wtrmj.png ***Other sample color https://i1243.photobucket.com/albums/gg541/hykcwyre/Passport%20Covers/Long%20VT%20PPC/201889_zps3y4ihhrp.jpg Left: Leather (1) : #0 Natural Leather (2) : W2 Red Right: Leather (1) : #0 Natural Leather (2) : W10 Black https://i1243.photobucket.com/albums/gg541/hykcwyre/Passport%20Covers/Long%20VT%20PPC/203188_zpstj1ktosx.jpg https://i1243.photobucket.com/albums/gg541/hykcwyre/Passport%20Covers/Long%20VT%20PPC/203196_zpshfebng8s.jpg Leather (1) : W10 Black Leather (2) : W2 Red https://i1243.photobucket.com/albums/gg541/hykcwyre/Passport%20Covers/Long%20VT%20PPC/203194_zpsyz72v9bl.jpg Leather (1) : S13 Chocolate Leather (2) : #0 Natural https://i1243.photobucket.com/albums/gg541/hykcwyre/Passport%20Covers/Long%20VT%20PPC/203190_zpsdyuchga3.jpg Leather (1) : S3 Peony Leather (2) : S3 Peony https://i1243.photobucket.com/albums/gg541/hykcwyre/Passport%20Covers/Long%20VT%20PPC/203202_zpscdov1imt.jpg https://i1243.photobucket.com/albums/gg541/hykcwyre/Passport%20Covers/Long%20VT%20PPC/203199_zpsnztkofjb.jpg https://i1243.photobucket.com/albums/gg541/hykcwyre/Passport%20Covers/Long%20VT%20PPC/203204_zps5mkem4ym.jpg Leather (1) : #0 Natural Leather (2) : E8 https://i1243.photobucket.com/albums/gg541/hykcwyre/Passport%20Covers/Long%20VT%20PPC/203197_zpsw0vavgyn.jpg https://i1243.photobucket.com/albums/gg541/hykcwyre/Passport%20Covers/Long%20VT%20PPC/203203_zpsejnbgwo4.jpg Leather (1) : A2 Leather (2) : W10 ***Remarks *Color may vary slightly from screen to screen *If you have any request (such as width or specific shape), please feel free to send us a message, we treat your order as priority.